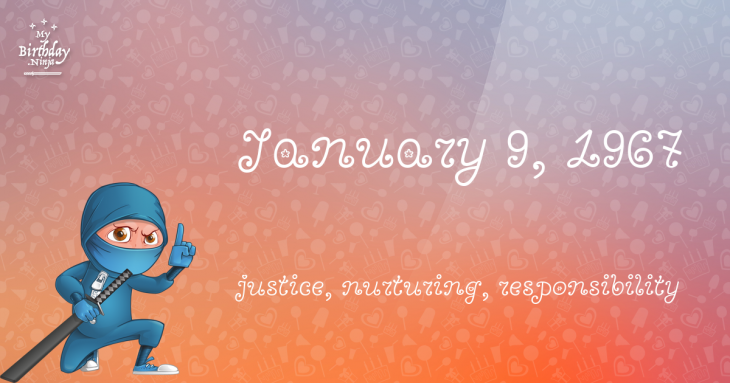 Here are some snazzy birthday facts about 9th of January 1967 that no one tells you about. Don’t wait a minute longer and jump in using the content links below. Average read time of 10 minutes. Enjoy! What day was my birthday Jan 9, 1967? January 9, 1967 was a Monday and it was the 9th day of the year 1967. It was the 2nd Monday of that year. The next time you can reuse your old 1967 calendar will be in 2023. Both calendars will be exactly the same! This is assuming you are not interested in the dates for Easter and other irregular holidays that are based on a lunisolar calendar. There are 263 days left before your next birthday. You will be 53 years old when that day comes. There have been 19,095 days from the day you were born up to today. If you’ve been sleeping 8 hours daily since birth, then you have slept a total of 6,365 days or 17.43 years. You spent 33% of your life sleeping. Since night and day always follow each other, there were precisely 647 full moons after you were born up to this day. How many of them did you see? The next full moon that you can see will be on May 18 at 21:13:00 GMT – Saturday. Fun stat: Your first one billion seconds (1,000,000,000) happened sometime on September 17, 1998. If a dog named Martie - a Norwegian Elkhound breed, was born on the same date as you then it will be 254 dog years old today. A dog’s first human year is equal to 15 dog years. Dogs age differently depending on breed and size. When you reach the age of 6 Martie will be 42 dog years old. From that point forward a medium-sized dog like Martie will age 4.5 dog years for every human year. British Prime Minister William Pitt the Younger introduces an income tax of two shillings to the pound to raise funds for Great Britain’s war effort in the Napoleonic Wars. The Fort Tejon earthquake strikes California, registering an estimated magnitude of 7.9. Anson Jones, the last President of the Republic of Texas, commits suicide. Umberto I becomes King of Italy. Battle of Bear Valley: The last battle of the American Indian Wars. Juan de la Cierva makes the first autogyro flight. British Prime Minister Sir Anthony Eden resigns from office following his failure to retake the Suez Canal from Egyptian sovereignty. President of Egypt Gamal Abdel Nasser opens construction on the Aswan Dam by detonating ten tons of dynamite to demolish twenty tons of granite on the east bank of the Nile. Martyrs’ Day: Several Panamanian youths try to raise the Panamanian flag on the U.S.-controlled Panama Canal Zone, leading to fighting between U.S. military and Panamanian civilians. Curious about this Purple Drizzle Cirrus? This is a party item you can activate and send to your friends when you play the free game Jump Birthday Party. It’s a fun and easy-to-play mobile game for all ages. Get free 1,000 gold coins when you download today! What does my birthday January 9, 1967 mean? 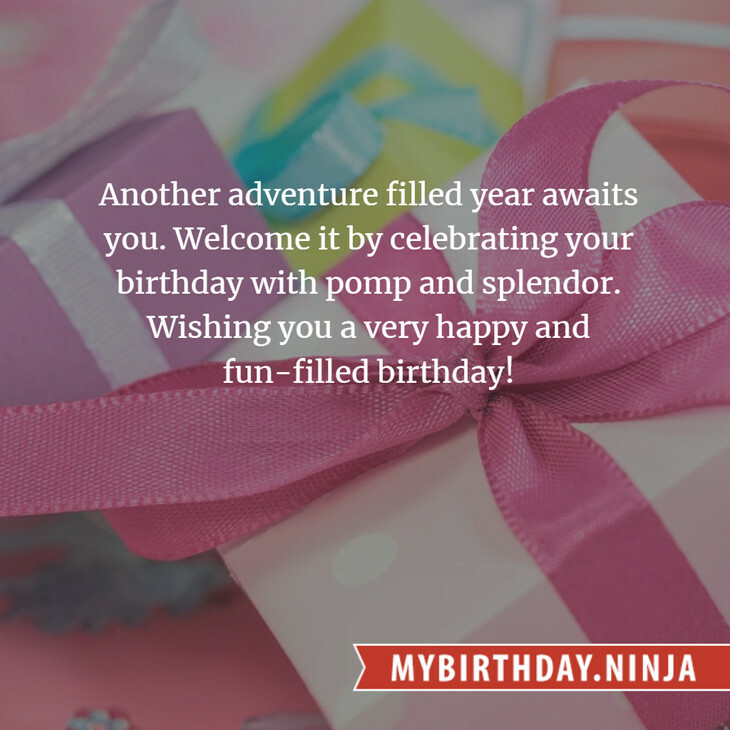 Your birthday numbers 1, 9, and 1967 reveal that your Life Path number is 6. It represents justice, nurturing and responsibility. You possess great compassion and seek to be of service to others. The following celebrities also have the same life path number: Napakpapha Nakprasitte, Raj Kapoor, Sandrine Blancke, Jeff Mills, Morissette Amon, Gene Pitney, Annemieke Verdoorn, Skrillex, Brian Thomas Smith, Minissha Lamba. What is the birthday horoscope for Jan 9, 1967? The Western zodiac or sun sign of a person born on January 9 is Capricorn ♑ (The Sea-goat) – a cardinal sign with Earth as Western element. The ruling planet is Saturn – the planet of discipline. According to the ancient art of Chinese astrology (or Eastern zodiac), Horse is the mythical animal and Fire is the Eastern element of a person born on January 9, 1967. Fun fact: The birth flower for 9th January 1967 is Carnation for friendship. What is the Love Match for Jan 9, 1967? When it comes to love and relationship, you are most compatible with a person born on May 24, 1937. You have a Love Match compatibility score of +199. Imagine being in love with your soul mate. On the negative side, you are most incompatible with a person born on January 26, 1958. Your incompatibility score is -146. You’ll be like a cat and a dog on a love-hate relationship. Arf-arf, I want to bite you. Meow-meow, stay away from me! How many babies were born on January 9, 1967? Base on the data published by the United Nations Population Division, an estimated 119,222,142 babies were born throughout the world in the year 1967. The estimated number of babies born on 9th January 1967 is 326,636. That’s equivalent to 227 babies every minute. Try to imagine if all of them are crying at the same time. What is the popular baby name on 9 Jan 1967? Here’s a quick list of all the fun birthday facts about January 9, 1967. Celebrities, famous birthdays, historical events, and past life were excluded. Try another birth date of someone you know or try the birthday of these celebrities: July 19, 1966 – Nancy Carell, American actress, producer, and screenwriter; October 27, 1992 – Junya Ikeda, Japanese actor; April 14, 1996 – Abigail Breslin, American actress and singer.